You must know the feeling. The living room table or couch is full of remote controls, and when you try to trust your instincts, you always pick up the wrong one. For years, Logitech’s Harmony remote controls have been a solution to this problem and have deservedly dominated the market. With everything trending towards smart homes, however, completely new devices came into play that didn’t exist years ago. The Logitech Harmony Elite is said to have responded to the emergence of the new technology, so I gave it a try at home. Here are my impressions. After setting up a Harmony Ultimate for my parents at Christmas three years ago, I’ve dreamed of having my own Harmony remote control. Though it’s not too chaotic to have three devices in the living room, it’s really great and pleasant to have just one. With the emergence of smart home technology, however, completely new devices are now also finding their way into my home. Of course, Logitech wants to support these devices as well, which actually works, aside from a few limitations. Anyone who has ever installed a Harmony remote control already knows this: the software is familiar with virtually every receiver, DVD player and music system that has been on the market for the past 30 years. I was impressed by that three years ago, and nothing has changed. I expected the remote control to recognize my Sky receiver, but didn’t think it would be able to support my Harman/Kardon Festival 500 speakers. Even better, all I had to do was simply search ‘Festival 500’ to quickly find out if they’d work with the speakers. And setting it up was also very simple. So then: you can add devices, set up scenes to watch TV and listen to music, and you’re ready to go. It should be noted that if you’re using the remote for TV functions, a separate scene should be used if a satellite receiver or TV signal receiver is used. I was also faced with this problem because the entire operation of the system runs via my Sky receiver, so the YouTube app on my Samsung smart TV was practically unable to be operated. But once you have these scenes set up, the Harmony remote is incredibly practical. Logitech also provides its own app that can be used as a remote control to set up the Harmony Elite. I’ve personally always found it completely absurd to use my smartphone as a remote for my TV. Turning on the phone and opening an app just to change the channel or the volume is too convoluted for me. Unfortunately Logitech doesn’t really make it any easier. The app is slow, confusing and not particularly pleasant to use. Of course, it can do its job, especially when it comes to configuring the remote. But in 2018, the fact that every setting requires seconds of waiting is very inconvenient. And no, it’s not synchronized with the Harmony remote control. Even through I haven’t used the app for a while, when I do open it, it acts as if I’m opening it for the first time, and the Harmony hub needs to be completely rediscovered again. 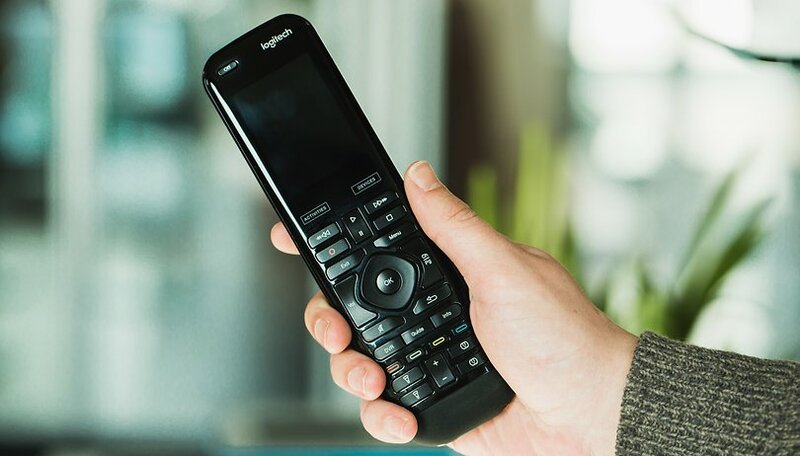 The Harmony Elite is the first Logitech remote with buttons dedicated to smart home devices. The bottom of the remote control has two buttons for lights and two buttons for other devices, such as outlets. If a smart home device is set up, these buttons will automatically be assigned accordingly. If they’re not required for smart devices, you can assign them to whatever you’d like. I was able to test the smart home functions of the Harmony Elite with a Philips Hue light. In this case as well, the set up was very simple. You connect with the bridge and practically everything is set up like in the Hue app. You can turn on the lights as you would expect to: press the corresponding button for a little longer and they will turn on. There are also ‘+’ and ‘-’ buttons in the middle to dim the lamps. I realized that the Philips Hue lights don’t work as perfectly as my TV system did. Again and again, I have to press the button twice until the lamp is switched on or off. I haven’t been able to determine exactly why this has been happening. In the end, Logitech is taking an understandable route. Their new smart home compatibility makes sense and is very useful. In particular, lamps are far more convenient to operate than with conventional apps. I would describe the problems mentioned above as early kinks that should be worked out over time. Logitech has released a new feature with the Harmony Elite: the Alexa Skill, which allows you to operate the remote control with voice commands. The remote control itself isn’t really necessary for this, since the commands are processed through the Harmony Hub, and the entire set-up is done via the Harmony app. If you look at the ratings that Skill has gotten in the Amazon store, you won’t be surprised. It’s not really a great product yet, because it just doesn’t really work. This is also what I’ve experienced with the Harmon Skill. Setting it up is easy enough, just like with Alexa. And without any problems Alexa and Harmony still understood my first command, ‘Alexa, turn on the TV’. But in the evening when I try the same command, it no longer works. So I say, ‘Alexa, turn on the TV via Harmony’, which at first was successful. Alexa, however, doesn’t like this command either, because the next day she isn’t able to understand it. Things are slowly but surely becoming more and more confusing. In the end, I was only able to turn on the TV when I said ‘Alexa, open Harmony’, and only then would she turn on the TV. The whole thing doesn’t really make sense. In the time it takes for Alexa to finally turn on my TV, I’ve already been pressing ‘Watch TV’ on my Harmony remote for a while. And that’s how I do it now. The idea behind the Harmony skill is interesting and funny at first, but in the long run it’s unnecessary. In its current state, the Skill is especially useless, because it just doesn’t work the way it should. I don’t understand how a command can be correctly understood before suddenly not being understood at all. Logitech needs to improve this quickly. The Logitech Harmony remote controls are unique in terms of their functionality and quality. No manufacturer can match them, and Logitech further emphasizes this fact through its compatibility with smart home gadgets. The Harmony Elite is a very good remote control that does what it’s supposed to do, and even a little bit more too. The setup is simple, all conceivable devices are supported and it’s always fast and accurate. Only the Amazon Skill doesn’t live up to the expectations of a Logitech product, but there is still hope that this will change. To conclude, I can say with certainty: I just don’t want to give it up! The price is a bit high at $299, but in the end it’s worth it. The Harmony Elite is a good remote, the hub works well - I prefer my Harmony Ultimate Touch with the additional hard-key only smaller remote you can buy as an option - Just enjoy using that more than the touchscreen. The Alexa integration works well for me I say "Turn on (Activity name) and it works 95% of the time which isn't bad for relatively early technology adoption. I like the Harmony remotes. My problem is with the software which constantly crashes with the same error on both my Wndows 7 and old XP machines. If I'm lucky I can make one alteration and save it before it goes again. I spent about two weeks in contact with their support team via email to try to sort it out but they finally gave up. So now if I need to edit my device I need to borrow a laptop from work. Hardly ideal. The annoying thing is that years ago when it was a standalone app it worked fine. Have you tried using the app? As stated in the article, it's not great but get's the job done. Thanks for the thought. I had a look but the app only seems to work with the (expensive?) hub based products and mine is a lowly 350 remote. Two of my devices require an air-mouse (my android TV Box and my LG OLED TV). Does the new Harmony remote have air-mouse capabilities? Otherwise my current Harmony is doing an excellent job and I will continue to use a separate air-mouse remote (with full keyboard on the back). The claim that this remote works with "everything" is unfounded. For example, it's unlikely you'll find codes for the JVC and Yamaha hall synthesizers. Much worse, it lacks the "jog" controls often found on VCRs and LV players. The Harmony Elite supports what's easy to support; users who need to replace missing, lost, or defective specialty controllers are out in the cold. I recently purchased a Pioneer omni-format optical disk player, and had to go through hell (or at least purgatory) to find the player's original working remote. It's possible to build a tablet-based controller -- with one or two rotary controls (a la Microsoft) -- but it would be just too much work for harmon/kardon. I tested the Harmony Elite for quite a while but found one major problem - it cannot cope with toggle switches. I had a Harman Kardon home cinema system and numerous items were controlled by multi-option toggle switches. The Harmony just got totally confused, as did I. The problem was solved when both the Harmony and the Harman Kardon were stolen! Yes, all current generation Harmony remotes do sync with the Android app. No, the Elite is not the first Harmony remotes to feature those home automation buttons. I use a (discontinued) Harmony Home Control, which is the Harmony Companion with those same home automation buttons added near the top. I cannot get Alexa working with Harmony either. The Harmony Ultimate does have nearly the same features as the Elite, but those who have used both usually greatly prefer the Elite's control layout. Also, only a limited library of devices (separate from their usual ginormous library) can be assigned to the home automation buttons. Harmony cannot learn a device and assign it to those buttons or to the home automation category. I'm an owner of the Logitech Harmony Smart Control and love it. The only thing I would change is adding a back light to the remote. With technology pushing us to own more peripheral devices it's super convenient to press 1 button to turn on my tv, cable box and sound bar all at once. I also have a Roku and Chromecast and using 1 remote to control all media is a godsend. Give yourself some time to set up and tweak settings so you can work around any quirks. Add Alexa and now all I have to say is, "Alexa turn the TV on/off," and it's done via the Harmony Hub. Pause and volume work too (along with rewind and fast forward but not as practical). And then when it's time for Netflix, "Alexa turn on Netflix," and voila. She switches inputs to Roku and turns on Netflix. This is the future. A Harmony remote with a hub is a must for any home entertainment system. Period. There definitely is a learning curve when dealing with the Harmony controls but I still use the commands regularly. One thing to remember is that Alexa remembers when you issue a Harmony command for 30 minutes. This means you can say, “Alexa turn the tv on,” and all associated devices you’ve programmed the Harmony to power will turn on. 10 minutes later if I say, “Alexa turn the tv down,” it’ll turn the tv off, thinking I said off, not down. But if I say, “Alexa volume down/Alexa turn it down,” it’ll get it right. This is still a relatively new technology so I think we’ve got another year or so for developers to fully iron out the kinks. I def. agree. We are in the really early stages. I am actually quite excited to see what developers will come up with. Considering how much effort Logitech put in building the whole harmony system, I was just pretty surprised how bad the Alexa skill actually worked for me. Articles, like this one, are useless. Better info by reading the Logitech web site. This remote has been out for about two years and is nearly identical to all other harmony remotes that exist. Harmony remote is the best remote for the masses, but Elite is over priced, get a cheaper version and get the same functionality. I have not seen the issue where the app doesn't sync with my hub each time. When I select my Watch TV activity with the Harmony Elite remote and then start the app it automatically connects to the hub and indicates I am using that same Watch TV activity. Let me get this straight. You find a phone app useless to control the TV because of how long it takes to get to the control but you have supposed smart lights that are only as smart as the person not turning off a wall or lamp switch and have no problem taking all the extra time to get to the phone app for them, correct? (Don't mention Alexa here as I can control the volume with my Google Home, no experience with Alexa but suspect the same.) As for smart devices being recent, that is far from true. Z-wave, x10, Insteon, and UPB have been around for years. All offering plug in devices, screw in between the build and lamp, and hard wired outlets and wall switches. My lights have come on automatically since my daughter was an infant 14 years ago. The outside lights have come on based on sunset all that time as well. And if we want them off I can flip the switch or use a phone app remotely. Been doing the phone app for over 5 years. So why is it ok to take all that time for a phone app and the lights but not the TV? It's true that smart home devices have been developing for a long while, but they're far more prevalent and advanced now. As for wanting to use an app for lights but not the TV, it's all down to personal preference. Using an app instead of a TV remote breaks attention more, because I'm more accustomed to the remote.